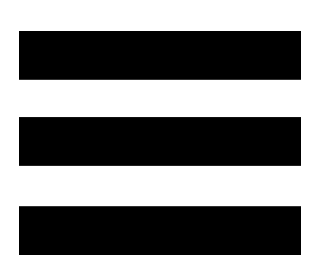 Balance #1 - A very complicated process. Normally I only use both hands to balance the rocks - sometimes I use my forehead in the process to help stabilize the positioning. 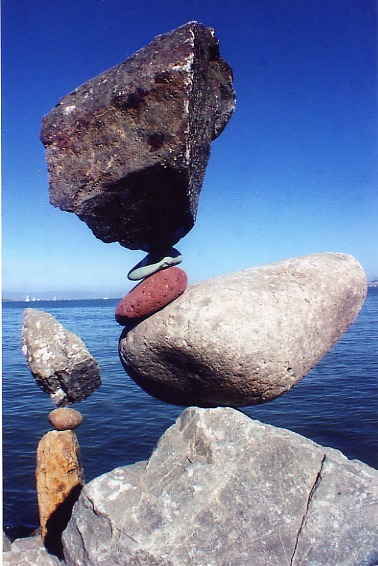 On this one, I had to use my left shoulder to hold and position the second rock (from the bottom) - then hold the 2 small rocks all together with my left hand which also try to stabilized the second rock. I lifted the top rock with my right hand very slowly - gently without making any shaky movement: on my self, the hands, the body, my breathing. 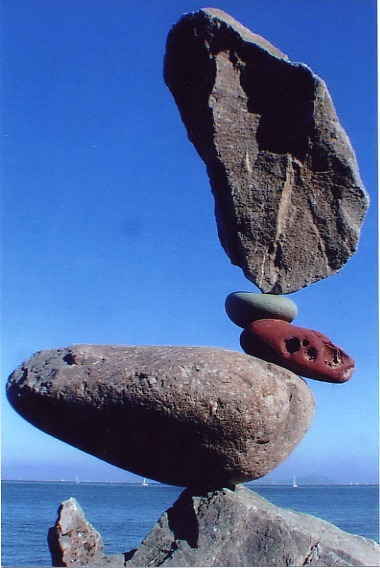 Mind you, the top rock weight about 30-40 pounds: Put on top of two small rounded rocks which were positioned on the slope on the second rock, standing all together, counterbalance on the first rock. Want to see what someone learned from Bill?